I’m particularly proud of a bit of magic I was able to do this past week. Over the weekend I had gone on a broomstick tour, which was definitely fun, but put me behind on household errands and chores. I wound up improvising every meal, using whatever I had sitting around. By Friday, my creativity was about at its end, as was my stash of ingredients! In terms of fresh produce, all I had was the tail end of a bunch of collard greens, a few stray carrots, and a badly bruised apple. Even though things were looking bleak, I still didn’t want to go out for dinner. Changing back into even the most casual of robes after putting on my pajamas is incredibly difficult, and delivery options are all fairly slow, unhealthy and expensive! I was still resolved to have dinner in! So I started playing around with my meager produce selection, adding a jar of prepared chickpeas from the fridge, and a leftover bag of dried grains. I wound up using a grain medley that I had found on sale at the apothecary, split it between two bowls, topped it with the roasted chickpeas and carrots with sauted greens on the side! (I left the apple for a green potion.) This bit of magic was perhaps not *much* faster than my delivery options, but it was tasty and filling. That it required only pantry basics and long-lasting produce earned this incantation a spot in the regular spellbook! Prepare grain according to package directions. While grain cooks, preheat oven to 400 degrees. Toss chickpeas and carrots with one tablespoon of olive oil, sriracha, maple and some salt (especially if you’re not using canned beans!). Stir to coat, then transfer to a baking dish or pan. Bake chickpeas and carrots for 25 minutes, or until carrots are tender. When there are about 10 minutes left on the chickpeas and carrots, heat up remaining tablespoon of oil in a medium skillet. Add minced garlic and collards, and saute until wilted slightly. Add salt to taste. 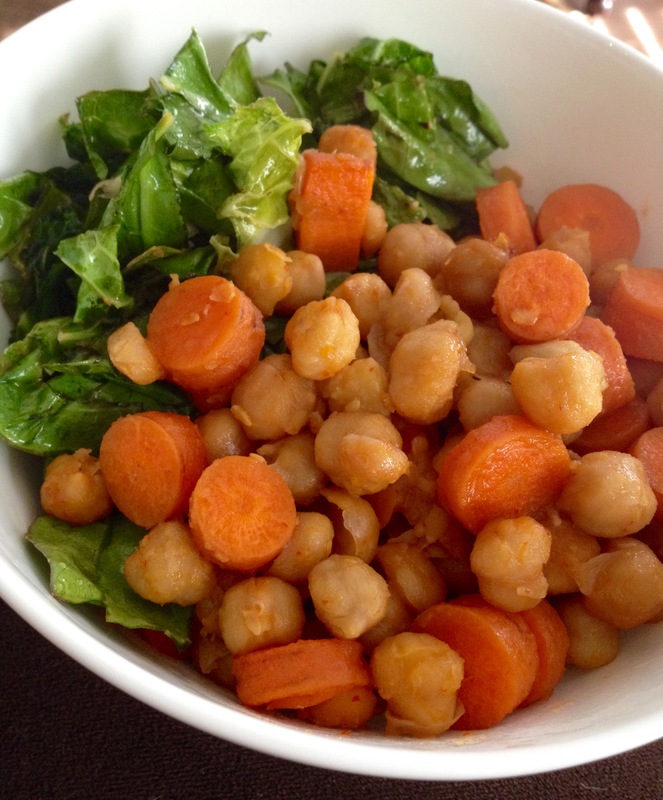 Assemble bowls with grain, greens, and chickpea carrot mix on top! Serve hot! This entry was posted in powerful & potent, quick dinner, simple and satisfying and tagged clean up, dinner, DIY, easy, healthy, homemade, simple, vegan. Bookmark the permalink. Thank you! It was quite the hit!